Service down or server down? How do you check if a server (an entire physical server or VM) is down? If it’s running some sort of web server, I’ll usually open up a browser and check if a page loads. This isn’t very useful, since a web server process could be down but the server is still up. In that case, I try pinging it. If that doesn’t work, I’ll try SSHing into it. If none of those work, I am pretty sure that the entire server is down. What if you wanted to do these checks from a Go program? As far as I know, ICMP echos (what ping uses) are not supported by the net package in Go. You could probably figure out a way to do it, but are there other methods? I think I’ve figured out a neat trick. TCP uses a 3-way handshake. 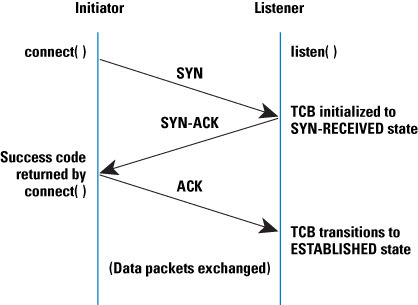 The “initiator,” or client, starts off by sending a SYN packet to a destination with a specific port. If there’s something listening on that port, the listener, or server, sends back a SYN-ACK. If there’s nothing listening on that port, the listener responds with RST. Now, what if the server is down? You won’t get anything back! I tried out a neat way to use this. This is a really simple example in Go. If err is nil, everything’s fine. If it’s not nil, you could check for two cases. If err has "connection refused", that means the server responded but nothing is listening on that port (there may be other reasons as well). If err has "no route to host", then I’m pretty sure that server is down. Of course, if the client / initiator has been blocked at a lower level of the stack, none of this is useful. Useful? Did I get this completely wrong? Let me know on Twitter.